Bluhm Sensei at Camp; Tango! And below is another Summer Camp highlight: A tango performance by Coryl Crane Sensei of North County Aikikai and her excellent partner. Crane Sensei has been studying tango for several years and says it has many parallels to her Aikido practice. Watch for a Biran article on the subject soon! Update: Crane Sensei’s partner in the tango is Florentino Guizar. Thanks again for the wonderful performance! We’re all home now from 2013 Birankai North America Summer Camp, nursing bruises and sore knees and folding laundry. We’re also reflecting on a memorable week of training and community. Chiba Sensei, Arnold Sensei and DiAnne Sensei were sorely missed, but the energy and enthusiasm on the mat this week in every class was a testament to their inspiration. A big thanks to Nomura Sensei and Aikido Institute of San Francisco for a great organizational effort (thanks for the ride to the airport, Cesar!). Check back over the next week as I post more videos and photos from camp. Linked are some great clips from Miyamoto Sensei, Drake Sensei, Lynn Sensei and Flynn Sensei. You’ll find more at http://www.youtube.com/biranonline. My apologies for the late video posts – uploads had slowed to a crawl by the end of our stay at SFSU. Excellent classes on the fifth day of Birankai North America Aikido Summer Camp — Neilu Naini Sensei of Clallum Aikikai in Washington and Kristina Varjan Sensei of Hawaii. Great classes with Miyamoto Sensei, Flynn Sensei and Boyet Sensei as well, along with weapons from Drake Sensei. Great classes today, starting with Zazen with Rodger Park Sensei, then Iaido with Boyet/Flynn Heins senseis (classes were split by level), then Aikido with J.D. Sandoval Sensei of Hayward Aikido. The morning finished with dan weapons with Flynn Sensei and Kyu body art with Miyamoto Sensei. 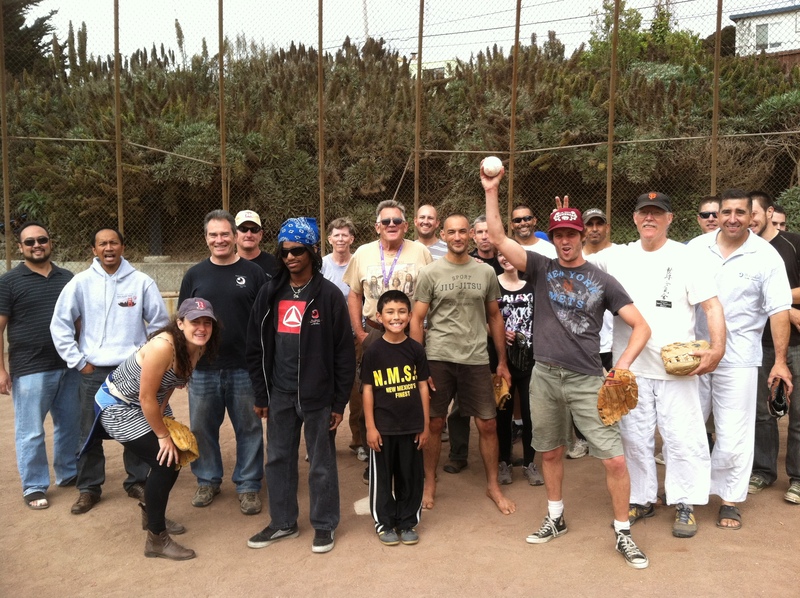 Then softball! Testing tonight, then another full day of classes and a final class with Lynn Sensei of Eastshore Aikikai. See you on the mat — just don’t throw me too hard first thing in the morning! A highlight from yesterday: P. Vargas Sensei of Aikido of Albuquerque. The long-awaited East Coast-West Coast Birankai North America Aikido Softball revenge match-up of 2013 concluded this afternoon, and a mighty victory was won by… but really, are winning and losing really that important? Why the attachment to results? Why be deluded by dualities? Fun was had, masterful hits were delivered, death-defying catches were made and rivalries fueled until next year. See you on the diamond! Great day at Birankai NA Summer Camp — staring with Zazen at 7 a.m., then Iaido with Nomura Shihan — see the image above of the Iaido students bowing in. Then classes with Dave Alonso Sensei of San Diego, George Lyons Sensei of Bucks County, Penn., and Miyamoto Sensei of Hombu Dojo. The day finished with excellent weapons sessions with D. Bluhm Sensei and Coryl Crane Sensei. See you on the mat tomorrow! 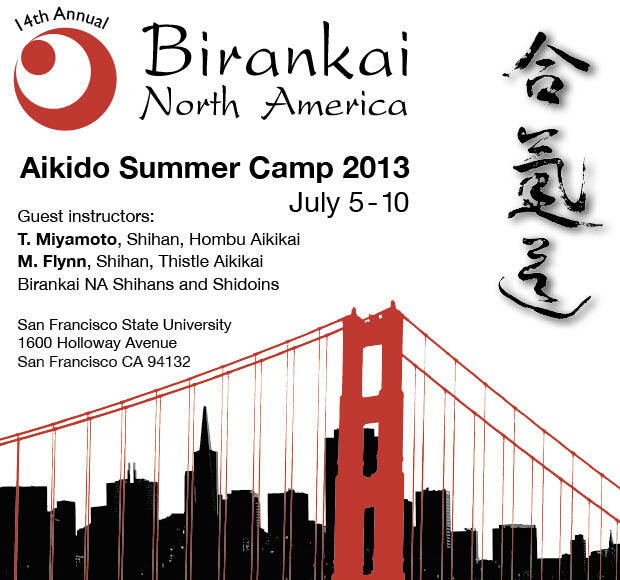 Great turnout tonight and dynamic practice for the opening of 2013 Birankai North America Aikido Summer Camp at San Francisco State University. Thierry Diagana of Singapore taught the first session and led some high-energy training. 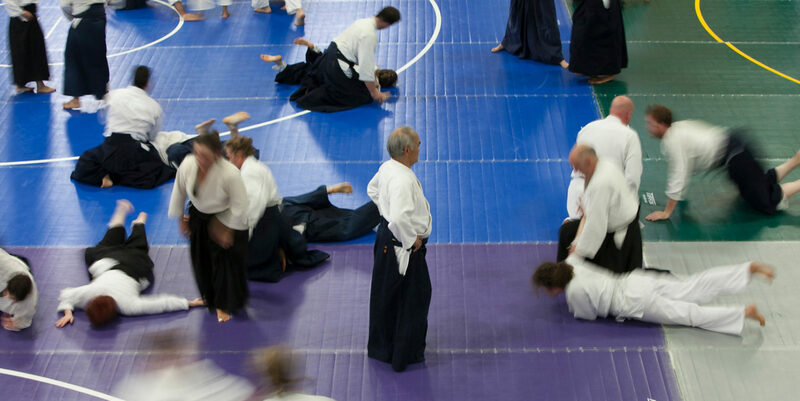 With the end of the BART strike and some beautiful cool weather, we’re ready for a week of intense Birankai Aikido! See you at Summer Camp! 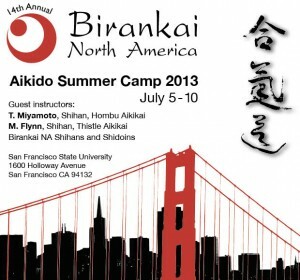 We’re meeting in San Francisco this week starting Friday for Birankai North America Summer Camp — see you there! All dojos and Birankai members will be getting print copies of our latest Biran newsletter, including a never-before-published letter from Chiba Sensei on the topic of failing a promotion test and some excellent essays and seminar reports. Watch this space for updates to the print newsletter and supplemental videos and photos, along with regular updates from Camp. See you in SF!